The Life Changing Power Of Awareness... Experience Energy Awareness Like Never Before! As you probably know, our world consists of two realities. The first is the physical reality that we all can see, hear, touch and feel. And then there is the energetic reality that only a fraction of the population can perceive. Awareness of this energetic reality is KEY to putting yourself in the flow, away from struggle and pain, at all times in life. "Awareness is the greatest alchemy there is. Just go on becoming more and more aware, and you will find your life changing for the better in every possible dimension. It will bring great fulfillment." If you'd like a simple framework for increasing your awareness in the energy world, there's a BRAND NEW masterclass at Mindvalley Academy happening this week. 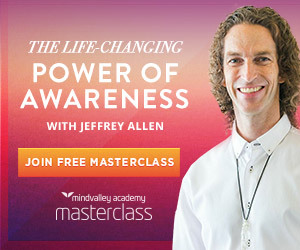 It's with Jeffery Allen, Mindvalley's highest rated spiritual teacher, often referred to as The Healer's Healer, and he guides you through a powerful formula to not only become aware but to manifest your ideal life through this awareness. ==> Identify whether you're succeeding in other people's dreams or your own. So many of us are programmed by the society to make goals that don't even matter to their soul's vision for their life on earth. In this masterclass, you'll learn a quick process to instantly "authenticate" your goals. ==> Explore the signs of waking up in the energetic world — most people are on the brink of awakening, and are experiencing amazing phenomena without being aware of it. All they need is one final push to awaken fully and gain the ability to consciously do something beautiful with this awareness. This Masterclass helps you identify if you're one of these people on the brink. ==> Learn how to tune into your inner compass and use it as a feedback loop to accelerate your journey towards living your greatest life. Plus hear Jeffrey's own inspiring story where his inner compass kicked him out of a stable but boring life to make way for a remarkable life of service and abundance. ==> Be guided through a powerful 5-step process to manifest a life that matches your vision for living heaven-like with total passion, fulfillment, and abundance without having to deal with the cyclic negative-energy influx that's common in the non-aware world. As you can see, there's so much value packed into this Masterclass that it's more than likely that you'll walk away from this as a changed person. That's why I'm encouraging you to register today. It's FREE, and you can choose a time convenient for you.